Betsy talks with two concerned grandparents (one almost a grandma) who'll be marching to D.C. later this month in an action called "For Our Grandchildren". Hear why this demonstration was organized, and how you can participate, in my conversation with Valerie Serrels and Richard Fireman. Sales of electric cars are finally beginning to accelerate. Doug Fox, President ofthe Michigan Automobile Dealers Association gives us he latest trending report. Two dedicated filmmakers -Alice and Lincoln Day-talk about their award-winning documentary, "Scarred Lands and Wounded Lives, The Environmental Footprint of War". This important but overlooked aspect of the consequences of our military action gets a close-up look in their film. We discuss the aftermath of President Obama's climate speech last week as well as the Citizen's Climate Lobby conference in D.C. Attendee and activist, Elli Sparks joins us to share her experience lobbying members of Congress for a carbon tax, including the ultra-conservative and influential representative, Eric Cantor! Journalist Peter Hart discusses his article for FAIR (Fairness and Accuracy In Reporting) about what's wrong with some newspaper coverage of climate change, including Obama's speech. Environmental activist Carol Misseldine joins us to discuss Green Cities, the positive impact of meat-free diets, and her late environmental hero husband, Charles McGlashan. On June 25, President Barack Obama delivered a historic speech on the climate crisis, detailing the history of our understanding of the science, calling upon all of us to be warriors for the protection of our planet, and noting the severe risks we face if we do not take extensive measures TODAY to reduce carbon pollution. 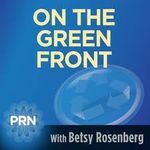 On this special episode of "On the Green Front," we broadcast President Obama's historic speech unedited--it is a speech that could rival his 2004 address to the Democratic National Convention in terms of its long-term impact! Citizen's Climate Lobby Conference's member, Rabbi Judy Weiss explains why this year's conference is shaping up to be the most effective yet when it comes to presenting a carbon tax proposal to Congressional members on BOTH sides of the aisle. Today in Washington, Heather Zichal, President Obama's point person on climate and energy issues spoke about what's ahead on climate policy. Among those on the panel was Anne Kelly, Program Director with the business investment group, CERES tells us what was discussed at this important meeting. The group Climate Parents is applauding this week's decision by the Kansas state school board to green light new standards for K-12 that will teach climate change and evolution as key scientific concepts. Climate Parents' Director, Lisa Hoyos, talks about the group's efforts to organize American families around awareness and action on global warming. Central Texas radio personality, Bill Paige, joins Betsy for some local perspective on the people and politics of Bastrop County, scene of one of the worst wildfires in U.S. history. Scott Wolland, Executive Director of Bay Area Wilderness Training, shares the positive and long lasting impact of getting at-risk youth outdoors. Rachel Caplan, Founder of the San Francisco Green Film Festival, gives a preview of the 3rd annual line-up of top environmental movies to see! Today we replay the two segments aired on March 20 and May 8. If the planet's atmosphere hits a milestone of 400 ppm of green house gases and hardly anyone notices, does it still count? Uhhh.....yes says David Turnbull, Campaigns Director for Oil Change International. We'll hear why this parts-per-million threshold better be a pivot point or else. The film maker of "Unacceptable Levels" explains whats at stake from exposure to everyday chemicals and what can be done about it. Ed Brown says it starts with awareness and the film, and this interview, tells us what we need to know.